Jessica and Lea are both young Hodgkin’s Disease survivors and met each other through our Sisters-in-Pink peer matching support program. The bond that formed between them was instantaneous and extended beyond their similar diagnosis. While no two people will ever go through such an experience in the same way, some things were very clearly similar (such as their positive attitudes and mutual love for travel) and even the things that were different (such as how they coped with their hair loss) only brought them closer. 1. You were both diagnosed with Hodgkin’s Disease – a type of cancer that many people probably don’t know much about or may never have even heard of before. How much did you yourself know about it before your diagnosis and what did you learn along the way? Jessica: Hodgkin’s Disease was completely alien to me! Both my doctor and my father (who is also a doctor) told me more about it. I found out that Hodgkin’s is a friendly, curable cancer that eventually helped me grow so much on a personal and spiritual level. Lea: Astonishingly, my uncle was diagnosed with the same condition a while back despite there not being a hereditary link. He was diagnosed with stage 4 Non-Hodgkin with a need of bone marrow transplant and is fully recovered today, which was far from being my case. To tell you the truth, I knew it existed, but I needed it explained to me in a way since I wasn’t diagnosed with the same lymphoma, but with a particular one considered to have a higher treatment success rate. I had every reason to be full of positivity. And of course, knowing my uncle had been through it all before made it feel like I would confide in him. 2. In one sentence, what was the first thought or reaction when your doctor told you the news? Lea: Actually, I read the news on the doctor’s lips, while isolated in the imaging room. ‘’Tumor’’ used to be a big word, but right then I knew it was never going to be the same. So, to describe it in a symbol, it’s the “no voice input button” on the keyboard. 3. No parent wants to hear their child has cancer and no doubt it’s even harder when the person fighting it is that young. How did your parents react/cope during this period? Jessica: My parents dealt perfectly with the news and succeeded to hide their concerns and worries. They both took amazing care of me, but made sure not to suffocate me. Lea: No one is ever prepared to hear that their child has a life-threatening illness. At the very least, they knew major changes will occur. They did the very best to give me strength and help me overcome this challenge in the best conditions. 4. What were the best and worst things anyone said or did for you during this period? Jessica: Turning my chemo room to a very safe and familiar environment where a friend sang and played the guitar, and another held me to sleep (since it was impossible to lay my head while wearing the heavy scalp). The worst thing that has been said to me was: “How would you know what fun really means? You spend your days sleeping” I took it very badly and actually couldn’t sleep at all that night..
Lea: The best thing I was told during this period was by a colleague that I once randomly saw in a pub: ‘Lea, I love your new style! Did you shave your head for a cause?’ I have plenty of other stories..
As for the worst thing done, it was having a person smoke right next to me. It was a sign of major disrespect. 5. How did you deal with the hair loss resulting from chemo? Jessica: I didn’t have to. I used the scalp cooling system: a scalp cap with a temperature of -6 degrees that prevents or lowers hair loss. The scalp experience honestly made my chemo sessions harder, I kept feeling sick because of the difference of temperatures between my body and my head. But the results were amazing – I kept all of my hair! Lea: I was put in touch with a Hodgkin’s disease survivor, who was a great inspiration. She encouraged me to shave my head early on as it is less traumatic when the hair begins to fall. It was hard for my parents, which is why I bought a wig to comfort them. But with time, they got used to the turban/hat idea and agreed that wearing colorful headwear made me look glamorous. I felt more comfortable and natural. It wasn’t always easy to find different styles of turbans in Lebanon, so I would order them online (from London and the US). I learned how to tie a turban through Youtube with Ascia Akf. I think it’s one of the simplest and most flattering turban styles. 6. How did you manage to juggle work during your treatment? Jessica: Being a freelancer made it much easier for me. After my chemo session, I rested for 3-4 days and recharged my energy to complete the work I had before the next session. Lea: I am blessed to have been able to keep my daily routine as close to normal as possible. I was able to incorporate my chemotherapy within my work schedule. My life didn’t really change other than not being able to do several sports activities or traveling. Maybe I wasn’t as energetic as I would have liked to be, but I managed. It was an expected part of the recovery process: the fatigue from chemotherapy was going to get better over time, the hair was going to grow back and the fear of recurrence was going to subside with the passing of the months. I kept busy going out with friends, dancing, jogging and getting on with my life again. I knew that soon enough my life was going to get back to normal. If not the old normal, then for sure a new one and my life will resume, despite cancer and beyond it, so why put my life on hold? 7. Did your love life, or perspective on relationships, get affected during this period? Jessica: My lover didn’t leave my side. I am forever grateful to the beautiful person who brought colors to my life during my tough days. Lea: My love life wasn’t really affected much, but my priorities in life have changed during my cancer journey. It made me focus more on the important things in life, such as family and other relationships. 8. Cancer is far from funny business, but humor can certainly lighten the mood. Were there any funny moments or stories that came out of this experience? Lea: Right before my last chemo session, I organized a Cancer Farewell at my place under the theme of “Kissing Cancer Away”. The goal was to gather all the people that stood by my side and supported me throughout my journey. 9. What drew you to take part in the Sisters-in-Pink program? Jessica: Once my treatment was over, people around me chose to forget and not talk about it anymore. But cancer literally changed my life and I felt the urge to talk to someone who would understand what it’s like to be cancer-free. Lea: I feel I have a lot to give. I was always socially-active and engaged with different NGOs, but my focus today is on Cancer and it definitely needs to be put into perspective. 10. How was the first meeting with each other? Jessica: I was very nervous before meeting Lea, but once we sat together, everything went so smoothly and we talked for a couple of hours. The most important thing that we have in common is that we both chose to take the best out of this experience. And I was very happy she shared her inspiring hair loss experience with me. Lea: Meeting Jessica was something I was looking forward to as I really needed to share my experience with someone who’d been through the same disease. We realized we had a lot in common, even though some things were quite different, such as the treatment methods. Overall, we both reacted the same way: we both recovered and are laid back.. and we both enjoy life a little bit more each day. 11. What do you wish more people knew or understood about Hodgkin’s Disease (or Cancer, in general)? Jessica: It’s OKAY to talk about it! You don’t have to avoid asking us questions; this won’t make us any less sick. I wish people knew that cancer might be the worst thing that happened to some, but it can also be the best thing that happened for others. Lea: If you have to pick one, this is the one to pick. No taboos or clichés on the topic. 12. What single piece of advise would you give someone who just got heard the phrase “You have cancer”? Jessica: You don’t always have to be strong; it’s ok to crash sometimes. But know that you will come out of this experience richer than you’ve ever thought you’d be. Lea: Suffering from this atrocity is a life experience. It’s fighting a good fight. 13. Any life-altering realizations as a result of beating cancer? Jessica: I’m grateful for every single thing and person in my life, every moment every day. 14. What are the top three things on your bucket list today? Jessica: Go on a spiritual trip, help people with cancer stay as positive as they can be, and maintain a healthy lifestyle. 1. One of my main concerns is to enforce an anti-smoking law in Lebanon. 15. Describe what being a survivor means to you in one word. Photographs provided are courtesy of Jessica and Lea respectively. OCTOBER is the international Breast Cancer Awareness month and what better way to show your support for women fighting cancer than by donating from your own hair to help them cope better with the harsh side effects of chemotherapy? One Wig Stand in collaboration with L’Oreal Professionnel are organizing a special hair donation event at City Centre Beirut, teaming up with top L’Oreal hair stylists for an afternoon of free cuts and styling for all who wish to donate. We have some special surprises also planned for all who make the cut that day. Feel free to spread the word to friends and family who may be interested! If you’ve made the cut recently and want to drop off your hair donation that day, please do! Please come with pre-washed hair. Type of Hair: Wavy or curly hair is completely acceptable so long as it is in good condition (not dried out or damaged). Colored Hair: Even if your hair is colored and/or with highlights, it might still be used unless it has been bleached. Bleached hair is more apt to break during the wig-making process, and as such, preferably avoided. Grey Hair: No more than 5% grey please as grey hair becomes fragile during processing and may not absorb color as well. How many centimeters are you planning to donate? Select the number of centimeters from this album and post it on your Facebook, Twitter or Instagram to represent your goal. This is a great encouragement for friends and family to also take part! If you are or know a cancer patient in need of a wig for her treatment, we are here to help. Contact us on 79-158471 or info@onewigstand.org to set a meeting and find the right match. Comes with self-check directions and booklet to aid in the BSE process. Helps you more clearly feel the shape of pre-existing or prominent bumps. Affordable at $25 (37,500 LL) per glove as it lasts 2 years. Can be shared among women in the same household, which is great if you have sisters. One-size-for-all format of glove may not work for everyone, especially those with smaller hands. May be loose on your hand due to its wide opening and mitten-like, rather than glove-like, cut. Not very reliable if used when standing up as liquid shifts downward. Hard to tell if it’s really working. Can be cold upon first contact with your skin. Liable to collect dust if not put away properly due to its polyurethane quality. 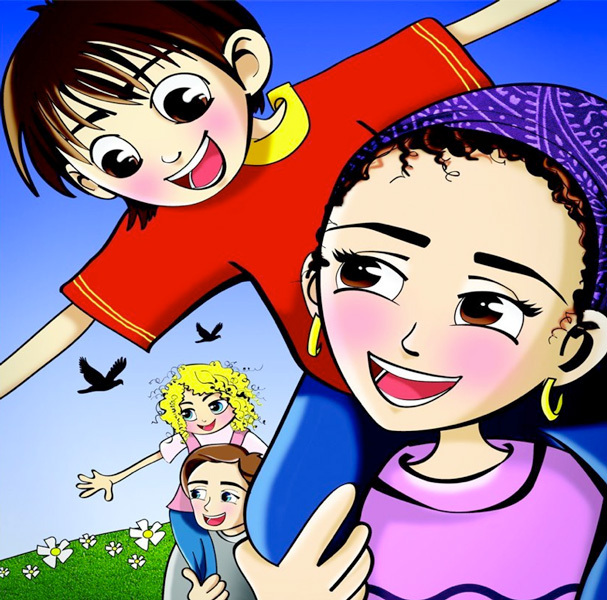 A few weeks ago, we came across “What Happened when Mommy Got Cancer“, a children’s book written by Mathuin, a seven-year-old boy of Lebanese origins and the son of Jocelyn Smith who went through breast cancer treatment. Having to go through such an experience is difficult for any family member of those diagnosed with breast cancer, but probably even more so for young children who really struggle to understand and cope with it. It’s really a scary time. Mathuin learned a lot from this experience and used writing as a form of therapy during this time. Once his mother had finished treatment and was better, he made the decision to help other children going through it by publishing this book. The end-product is a hopeful and beautiful personal story displaying wisdom and maturity beyond Mathuin’s young years that is sure to inspire any child to feel less alone. You can get to know Mathuin and the book better in this TV interview. 1. How was your experience with illustrating “What Happened when Mommy Got Cancer”? “What Happened when Mommy Got Cancer” is a children’s book about a mother who is fighting breast cancer and it shows how this affected her own children’s daily life. Illustrating this book was a unique, challenging and beautiful experience for me. It was unique because her son, Mathuin, who is seven-years-old at the time wrote it and because it is about a sensitive subject: cancer. It was challenging because the illustrations needed to reflect a positive ambiance and help other children in the same situation feel better and stronger especially as the situation is delicate, hard and sad. It was beautiful to know such positive people full of hope and love. 2. What made you decide to take on this project? It was out of the blue. The founder of Beirut Animation Network (BAN), Alain Nasnas, called and asked me if I would be interested in illustrating a new book. BAN was responsible of finding the right illustrator of this book, so he suggested me. In such situations, I always read the book first. If it’s something that I don’t think I am suited for after the first few chapters or lines, I’ll call and say this book isn’t my strong suit. But in this case, I immediately accepted after reading the title and knowing that a seven-year-old child had written it. It was a new and interesting challenge for me to work on a book by a seven-year-old child who wanted to share a message of hope with other kids passing through the same situation. 3. Was this the first time working on a children’s book with such a sensitive subject matter? I believe that all children’s books are a sensitive matter to deal with. Illustrations have a big psychological effect on children and that’s why you have to consider these factors sensitively while illustrating for them. It was, however, the first time I work on a book with such a serious and delicate subject matter that was not only dedicated for kids but experienced by a child having gone through it. As such, I had to consider not only the psychological effect upon children but the psychological state of the child-writer himself. 4. How involved were you in the book production process? I was only involved in the illustration part of the book production process. After receiving the final text of the book, I had to work on 15 illustrations, including the cover. The illustrations production process consisted of 5 stages: characters design study and illustration, page sketches, final line-art, colored samples, and final coloring process. While the illustrations were being worked on, Mathuin, Jocelyn (his mother) and myself determined an overall art and mood direction for the book. 5. The characters in the book are based on Mathuin and his family but it appears so even in the way they look. Was this a conscious decision and did Mathuin know in advance how he wanted you to portray the family’s experience with cancer? 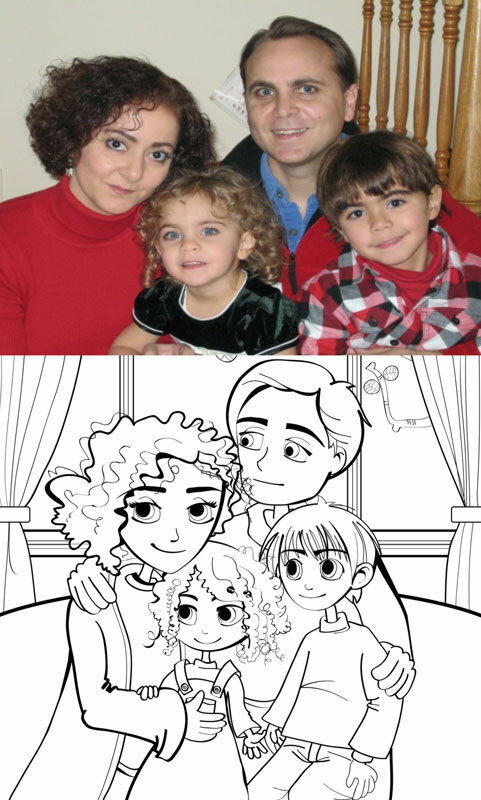 Yes, Mathuin wanted the characters in his book to look like his family, but in a more cartoon-ish, simple and fun-to-look-at way. So they sent me one picture as a reference, representing the whole family gathered, with the remark: “We hug a lot in this family”. It was enough for me to create the overall look-and-feel of the family characters and the rest of the book illustrations. 6. Did you face any challenges with tackling the subject of cancer in this book, especially when it came to portraying such difficult and emotional scenes as the mom sick in bed or losing her hair? Her words hit me deep. While the main subject is cancer, the illustrations should reflect a positive atmosphere full of hope and love. The challenge became bigger in every scene, but Jocelyn and her family’s positive attitude was a great inspiration for me. I simply translated their beautiful soul and positivity into illustrations. It even made the hair loss section one of the most fun stages of all! 7. As one of the few children’s books currently available in the market here in Lebanon, how have other children reacted to the book and do you feel it has helped them cope better? The book has gotten a good reaction from other children, especially from those living through the same situation. It helped them know they were not alone and that other families are struggling with the same issue. The most important part is that it showed them how to have hope and be positive. It made it easier for them to understand cancer and how it affects families and their lives. “What Happened when Mommy Got Cancer” is currently available in all Antoine bookstores in Lebanon for $20 with part of the proceeds of its sales being donated to the Conquer Cancer Foundation. “In September of 2007, I married the girl of my dreams. Five months later, Jennifer was diagnosed with Stage 3B Breast Cancer.” starts the story of an American couple’s battle against breast cancer and how it changed both their lives forever. Following plenty of ups and downs in her cancer treatment, Jennifer unfortunately passed away but the photographs taken by her husband Angelo stand as a honest testament of what this part of their life was like and the beauty she has left behind to inspire others. After seeing the photographs (they stir up emotions each time we look at them) and reading the moving story behind them, we wanted to share it with others in this part of the world in the hopes of spreading Jennifer and Angelo’s message. A passerby stares as Jen hails a cab. 1. What was your first reaction upon hearing your wife was diagnosed with breast cancer in 2008 and how did you deal with it? When we found out that Jennifer had breast cancer, I remember immediately going numb as the world, except for Jen, blurred out of focus. Jen and I were close from the beginning of our relationship and we had a wordless bond that would never be and could never be broken. I remember looking into each other’s eyes and knowing that as long as we had each other, we would deal with everything that came our way. From the beginning of our battle with cancer, Jen and I communicated with each other. We listened and knew that we were still in love, still a married couple, still best friends. There were times when our relationship was heavier on my shoulders and other times when Jen carried the load. On our wedding day we said “forever, in good times and bad, in sickness and health,” – both Jennifer and I took that seriously and we lived for every second with each other. 2. What was your main role, as her husband, during her treatment and what advice can you share with other men whose partners are going (or about to go) through the same thing? A home nurse cleans and inspects Jen’s PICC line, a catheter that is inserted into her vein and runs to a large vein near the heart for intravenous access of in Jen’s case, chemotherarpy and pain medications. My main role was whatever Jen needed. If Jen needed to laugh, I was a comedian. If Jen needed quiet, I didn’t talk. If Jen needed love, my arms were open. I don’t think there is any set way to be or road to follow but what helped me was listening to Jen and trying to stay a step ahead of her. Flowers, doing the dishes or laundry, making the bed… all of these little things made life easier and more enjoyable for Jen. Jen made things easy because she was so positive and graceful but I still had to pay attention and at times read her mind. It is also important for partners to take care of themselves both physically and emotionally. Find something that distracts you, something to channel your emotions into. For me it was my camera. Exercise, friendships, art – find something to rejuvenate your spirit. 3. What inspired you to start documenting your daily life with cancer through photography? Was it a conscious choice? Jen and I lived in Manhattan but most of our family members and friends lived in Ohio. After Jen’s re-diagnosis, we found that they didn’t understand how serious things were and how much we needed from them. We tried talking and sending emails but it seemed like people were still not getting it. Then we realized that unless they saw our day-to-day, they wouldn’t be able to understand. Without walking in our shoes, how could they really understand? That’s when I started to make photographs. The photographs were initially intended just for family and friends so that they would become more involved – we needed them to be with us. When I started posting the photos online, people reacted and Jen and I realized that this was a way that we could make a positive impact during such a trying time. 4. Did Jennifer feel uncomfortable at all with being photographed in this sensitive state? From the beginning of our fight against cancer, Jennifer was open and shared her experiences. Jen wanted people to know what she was learning and she was very aware of how, by sharing their experiences, others before her had helped her get through each day. A nurse pushes chemotherapy treatment, so toxic that the nurse must wear protective clothing, into Jen’s medi-port. When I started to make these photographs, I told Jen that whenever she didn’t want the camera around all she had to do was say stop. I told her that if she wanted all of the photos to go away I would break the hard drives with no questions asked. There was only one time when Jen asked me to put the camera away. and in a typical Jennifer style, she said, “One more photo, then stop.” When she said this I was so happy because I knew how much she trusted me. Jen rests with our cat Brea while I prepare her daily pill regimen. 5. Is there a particular reason you chose black and white photography to share her story? I’ve always loved black and white photography, and felt that by “removing” the color I could really focus on what was in the image. 6. Which of the photographs from the series was her favorite? Which was yours? All of these photos are so close to my heart, I don’t know that I can choose one image as my favorite. The best I can say is the photos of Jen and I together are my favorites because it was Jen and me. I think Jen would say the same. 7. What have you been able to achieve so far by showing the photographs? How have people, and especially cancer patients, reacted to them? Late for a brain radiation apointment, nauseated and tired, the smells from our neighbrohood were nearly too much for Jen. The reactions to these photos has been quite humbling. I have received more than a dozen emails from women who scheduled mammograms because of Jen. I cannot put into words how this makes me feel. Some days it is all that I can hang onto to keep moving forward. When I started to share these photos, I was concerned that I would scare people, especially people who were recently diagnosed or in the midst of their fight. Thankfully, people with cancer have been inspired to keep fighting and Jen has become a hero and inspiration to many people. 8. What are your future plans with this project? Are there any breast cancer groups you’re currently (or planning on) collaborating with? Right now, I am about 75% finished with editing these photos and will be publishing a book about our story. I am also starting a non-profit organization in Jen’s name that will assist people with cancer as they deal with the daily financial struggles that come as a result of cancer treatments. Waiting to speak with a radiologist about treatment of the cancer in her bone and on her liver, Jen is anxious and irritated. Cancer is not a battle that should be fought alone. Support from family and friends is so important. Don’t stay away from someone who is fighting cancer because you don’t know what to say or do: you do not have to “say the right thing,” or know all the answers. Send a card and say “I love you.” Send a text message with a smile, bring dinner, what ever.. Just don’t run away. Celebrating our 4 year anniversary at a retaurant in Greenwhich Village, Jen stares off in the distance. Jen always said to “Love every morsel of your loved ones” and she was right. No one knows what tomorrow will bring. You don’t have to be happy every second, just don’t take any seconds for granted. Check out the “My Wife’s Battle with Breast Cancer: The Battle We Didn’t Choose” website and facebook page for more information. All the photographs in this post were shared with us by and are copyright of Angelo Merendino.